A treasure map can lead to a great pirate party. Using pirate invitations for a themed party adds swashbuckling fun to the theme. From simple styles to elaborate pirate creations, these clever invites can help set the scene for a memorable event. Whatever the reason to celebrate pirate-style, pirate invitations are a creative way to convey the theme of the event to potential guests and to give clues about the swashbuckling fun ahead. Pirate party invitations can range from whimsical to elegant depending on the party's mood. Message in a Bottle: A small bottle, preferably weathered, with a cork stopper is perfect for conveying a pirate theme. Add small shells and a bit of sand to the bottle for even more realism. Without the bottle, a scroll of paper is still a creative option. 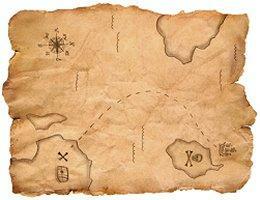 Custom Treasure Map: Create a customized treasure map with weathered parchment paper. The edges of the paper should be frayed or charred, and the map could offer directions to the party location. Shells: Writing an invitation on a shell or sand dollar adds a tropical touch to the theme. Alternatively, a small shell can be attached to a paper invitation. Treasure Chests: Small wooden or plastic treasure chests are the perfect place to hide a party invitation. Fill the chest with costume jewelry, beads, plastic jewels, or other booty for fun accents. Skulls: A small toy skull with the invitation stuck through the eye socket is a great way to emphasize on the dangerous life of a pirate and the dangers a party guest may face if they ignore such a clever invitation. Regardless of the type of invitation the host chooses, using it to convey the theme of the party will help guests understand the type of event and what they might expect if they are able to attend. Ahoy ye scurvy dogs, it's fair time to set sail for distant shores in search of buried treasure, ripe maidens, and the odd bottle o' rum. Notify the captain of your intent to join the crew right away, lest he sentence ye to walk the plank! Argh, the treasure's been found and it's time to share the booty with other worthy souls ready to challenge the seven seas. Let your choice be known ASAP or you'll be swimming with the fish! The seas may be rough but so long as the rum holds out we'll sail on to distant shores. Join the crew for treasure and treats while we plunder the shores of celebration! Of course, all invitations should include all the vital details of the party, including time, date, location, and any other information guests should be aware of before they attend. Pirate invitations are a fun way to announce a pirate-themed party to friends and family. From the glitter of a treasure chest to the sharp edge of a cutlass, there are many options to choose from before setting sail for a great event.